Some structures require more attention than others. Depending on where your building is located, it may be subjected to more dirt than in a different district. This is particular trouble in industrial areas, where smog can cause buildings to decay much faster. To preserve good visibility and a welcoming atmosphere, you should get rid of the dirty elements. How to do so when it’s more demanding than a standard surface cleaning? The best way of getting rid of such stains is high-pressure cleaning, and with the help of R.A.I.L., you can have it performed on your building, no matter how high. 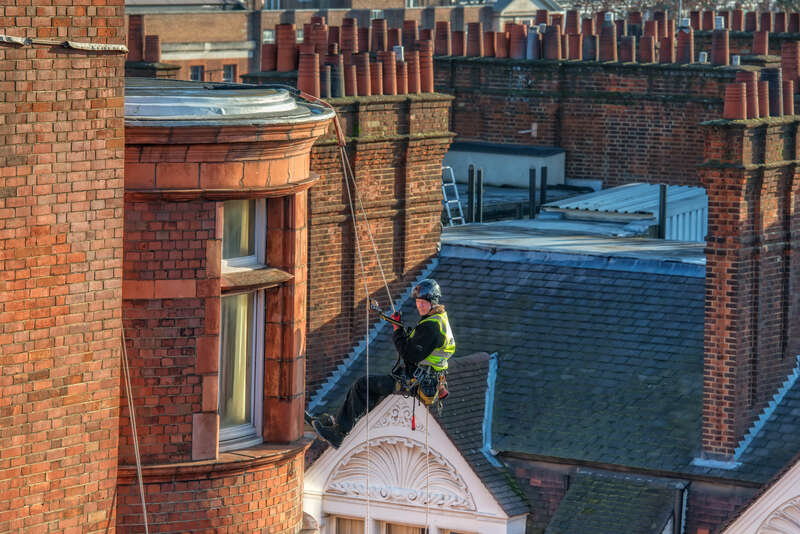 Thanks to rope access, our specialists can easily get to even the hardest to reach areas of your buildings with little effort and without the use of heavy equipment. Relying on the solid rope equipment and a great preparation thanks to IRATA training, they can freely access high spaces and perform difficult tasks there, while at the same time minimising the risk of falling down or dropping any tools. This method of high-pressure cleaning is thus not only cheaper and more efficient than others, but it’s also the safest you could ever hope for. Our experienced team is happy to help you with any challenges and obstacles you are facing. We will cleanse any staining with our high-pressure cleaning team so you can enjoy the view of the city.